More than 600 bodies have been pulled from the rubble of a Bangladeshi clothing factory complex that collapsed last week, police say. 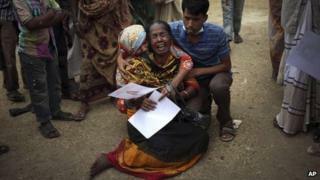 Dozens more bodies were retrieved from the ruined eight-storey Rana Plaza on Sunday. Bangladesh's worst industrial disaster has sparked nationwide anger. A preliminary government investigation said this week vibrations from four generators on the upper floors triggered the collapse. Main Uddin Khandaker, head of a government inquiry team, said the generators started up after a power cut, sending powerful vibrations throughout the building, which - together with the vibration of thousands of sewing machines - triggered the collapse. The building had been constructed with weak materials, such as sub-standard steel rods, Mr Khandaker added, which meant it could not withstand the vibrations. The architect of the building has said it was designed to house shops and offices rather than factories or industrial equipment, and that three floors had been illegally added to the original building. On Sunday evening, police working at the site of the collapse in Savar, outside the capital Dhaka, put the death toll at 610. But they would not say how many more bodies were likely to be recovered from the area. Nine people have been arrested in connection with the collapse: the building's owner Mohammed Sohel Rana, his father Abdul Khalek, four owners of garment factories that operated inside the building, and three engineers. Factory workers have held daily protests demanding improved safety regulations and calling for tough punishments for those responsible for the disaster. But Bangladeshi Finance Minister Abul Maal Abdul Muhith said on Friday he did not think the collapse would have a "really serious" impact on the country's garment industry. Steps had been taken to prevent future accidents, he added. Bangladesh has one of the largest garment industries in the world, with factories supplying Western retailers such as Primark in the UK and Italy's United Colours of Benetton. The EU has said it is considering "appropriate action" to encourage an improvement in working conditions in Bangladesh's factories, including the use of its trade preference system, which gives Bangladesh duty- and quota-free access to markets in member states.